pdfauxinfo can set the auxiliary information to PDF file using PDFKit in Cocoa. 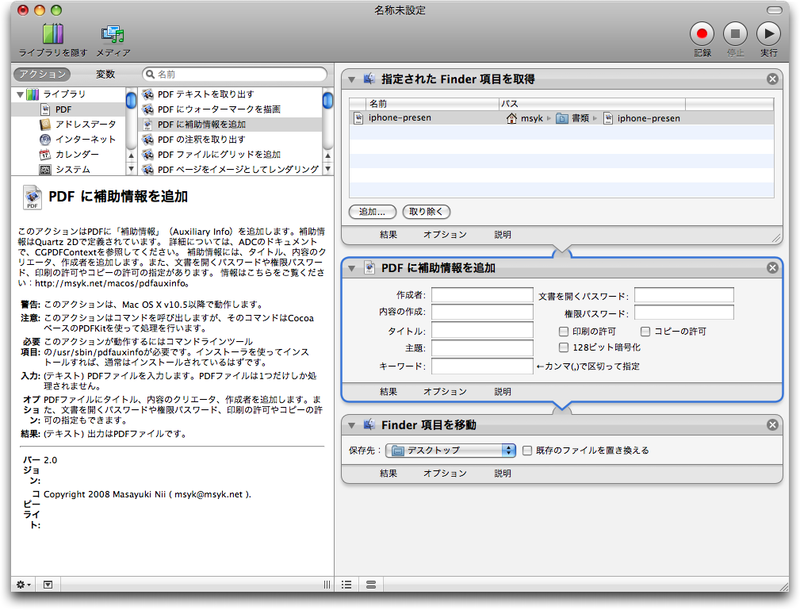 This is the version 2.x command line tool for Leopard only. --sourcePDFFile, -i Input_File_Path            Original PDF File path. --convertedPDFFile, -o Output_File_Path        Converted PDF File path. --author, -a Author_Name                       Author info of the converted PDF. --creator, -k Creator_Name                     Creator info of the converted PDF. --title, -t Title_of_Document                  Title of the converted PDF. --userPassword, -u User_Password               User Password for the converted PDF. --ownerPassword, -x Owner_Password             Owner Password for the converted PDF. --permitPrinting, -p [YES|true|1|NO|false|0]   Permission for printing the converted PDF. --permitCopying, -c  [YES|true|1|NO|false|0]   Permission for copying the text. --subject, -s Subject                          Subject for the converted PDF. --keyword, -k Keyword,Keyword...               Keywords for the converted PDF, devide by ','. --encryptionKeyLength, -e length               Encryption key length by bit. --help, -h                                     Show this message. the others means not permitting. The encryptionKeyLength option must be a multiple of 8 between 40 and 128. If this option is not specified, 40 bit will use to encrypt. If this option is set to other than 40, 128 bit RC4 will use to encrypt. Required options are sourcePDFFile and convertedPDFFile. pdfauxinfo v2.x works just only Mac OS X Leopard or later.